After a thorough refresh it was time to explore the ship and this is where any grumbles about room-sizes subsided somewhat. Aside from the top deck of the ship, the primary area where most will focus their time is around level five. Here and the adjacent decks can be found the majority of the places to dine, shops and lounges. Possibly the star attraction of this level is not one of the incredible restaurants but the robot bar-tenders at the Bionic Bar. 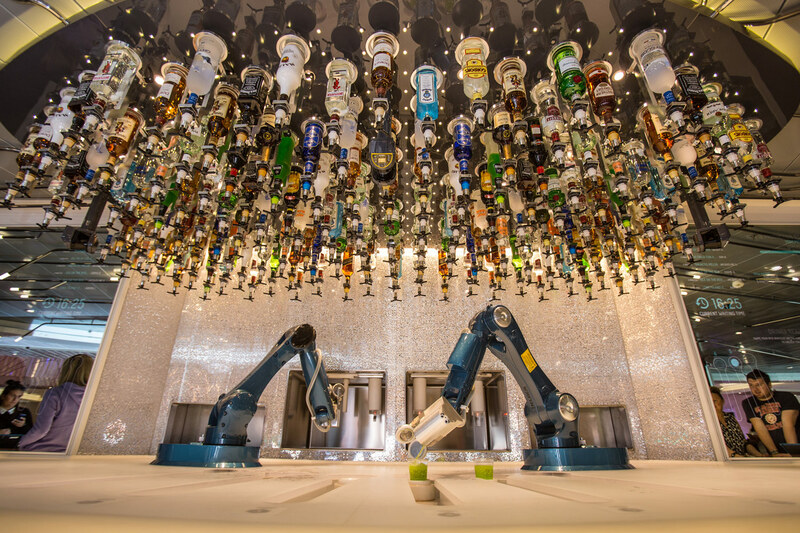 This bar provides a small insight into the amazing technology installed on the Anthem of the Seas. To order a drink off the menu, just make your selection on the tablet computers, stand back and marvel at the way these robotic arms mix, shake and construct your chosen beverage to music, it really is a unique thing to watch. Once your drink has been prepared you simply walk up to the bar and place the smart band on the sensor to receive your order. If you’re feeling bold and decide to invent and name your own cocktail, be prepared for feedback, people can either praise or admonish your efforts via the ratings app. Whilst on the subject of technological treats, another of the must see attractions is TWO70, a 270 degree 12k one-of-a-kind cinematic experience where robotic screens create stunning visual imagery in the amphitheater like space. Wonderland, with more than a nod towards the Lewis Carroll book, Alice’s Adventures in Wonderland. This is as much theatre as it is a dining experience. 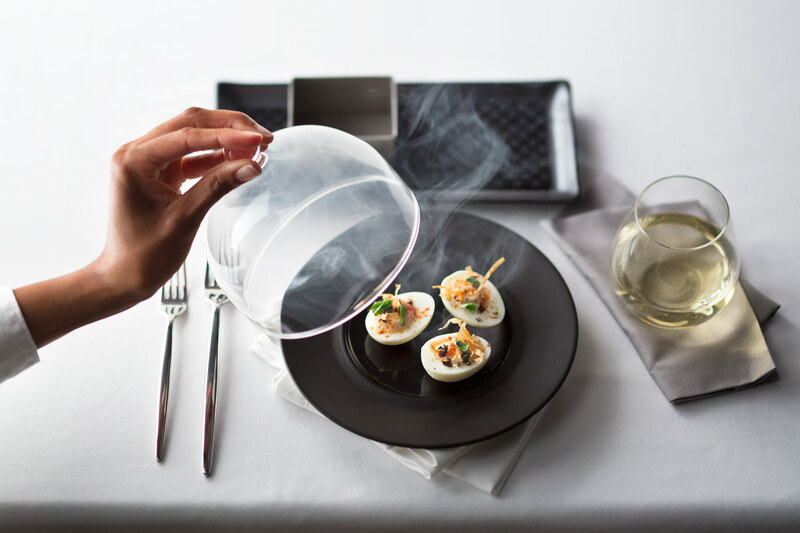 Here the inventiveness and quality of the food must be commended and the ebullient staff go to great lengths to enhance the whole dining experience, but a word of warning, you do need to be in the right mood to appreciate the full theatrical impact. Jaime’s Italian by Jamie Oliver and staffed by his renowned team of young chefs is another of the must try places and if you’re looking for fine-dining then our preferred places are Chic and Silk. Probably our favourite place to eat within this general area was Izumi offering a fine array of Japanese cuisine, most of which passed the stringent Godbold healthy eating test. During our voyage we had the pleasure of meeting Izumi’s principal Travis Kamiyama who provided a first-hand demonstration into the exacting art of sushi-making. 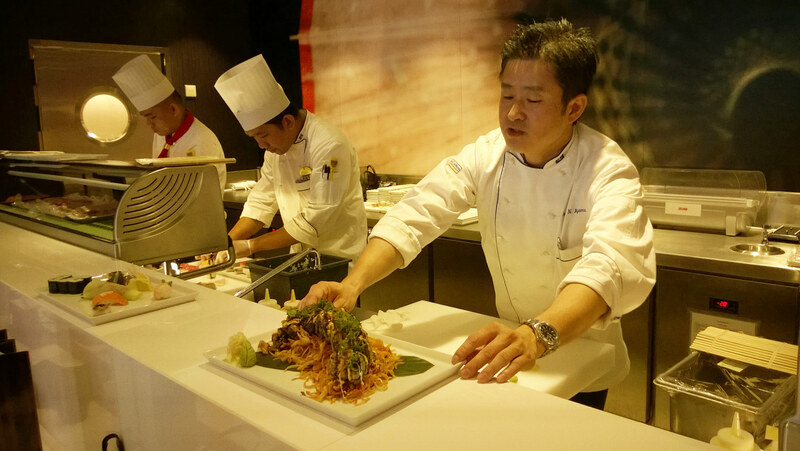 Given his extremely high standards, I was left in no doubt that the food at Izumi would be of an excellent quality. For both Natasha and myself, looking good and feeling good it very important and although copious amounts of delicious food may be a welcome treat to some, we prefer to enjoy food that doesn’t come with a small burden of guilt and afterthoughts of hitting the gym, this is where Devin Alexander “steps up to the plate”. Devin is a renowned celebrity chef and author (along with being an extremely nice person) specialising in creating low-calorie versions of some of the world’s most popular food. Here you’ll find delights such as her take on the world’s most famous burger, Bacon, Egg and Spinach Wraps, Chocolate Chip Pancakes, Chorizo Lasagna, Buffalo Grilled Chicken Salads, Greek Nachos, Pulled Pork Tacos, Chinese Pepper Steaks, Awesome Meatballs all at mindbogglingly low calorific levels. This is for us the perfect place to eat, chat and be merry. With Travis’s Sushi offering and Devin’s treats, Natasha and I could enjoy ourselves and walk off the Anthem of the Seas rather than being hoisted off at the end of the sailing. 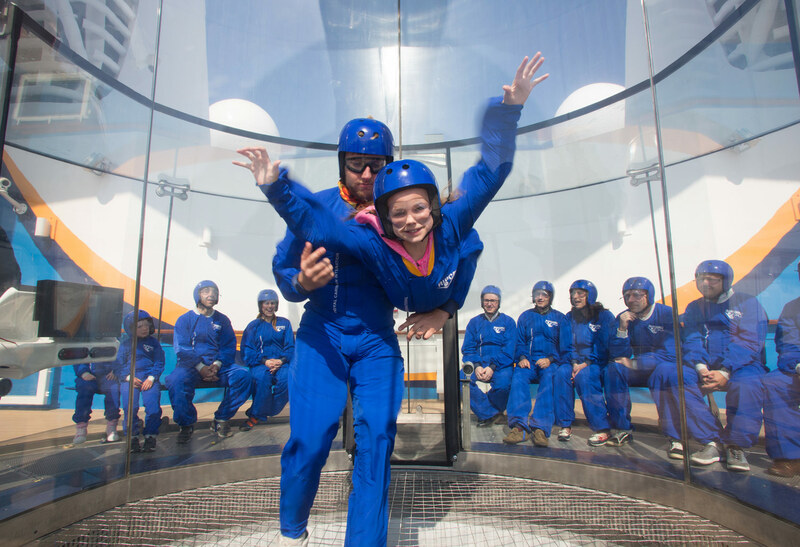 When it comes to general attractions, once again the Anthem of the Seas does not disappoint with bumper cars, theatrical showcases and musical shows, multiple pools, an extremely well equipped gymnasium, skydiving simulator and the much publicised North Star, a viewing pod which allows you to have an incredible view from 300 feet above the sea. Although Natasha and I were booked to experience the North Star, once more those pesky gremlins popped up and meant that our views were restricted to the top deck of the ship. All of the swimming pools looked inviting, some of which are indoors while other outdoors, and on this occasion joining the multitude of pasty white fleshy bodies splashing about in the water didn’t endear us enough to try them for ourselves. With all the glitz, glamour and technological wizardry, we were a little confused as to what demographic the Anthem of the Seas was aimed at. This question was answered by the owners of Royal Caribbean at the official press conference, in simple terms it was aimed at everyone. 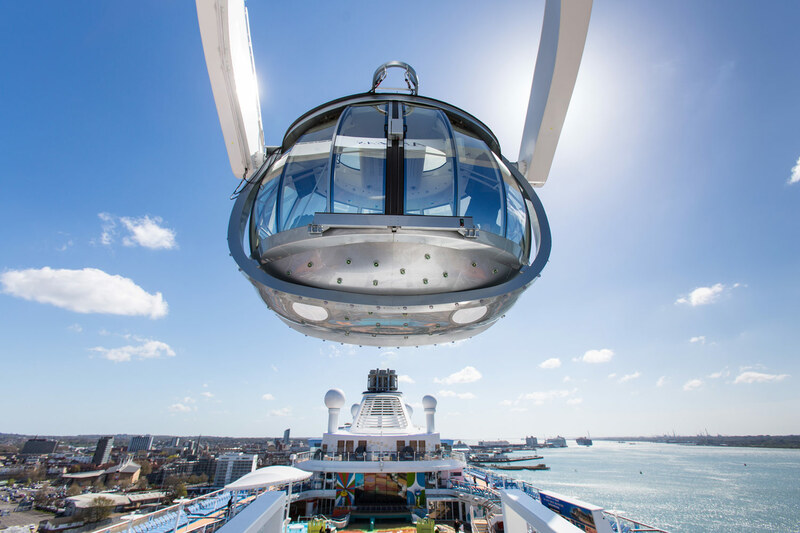 The Anthem of the Seas was designed for all generations of a family to go on vacation together. The incredible technology is not designed to alienate anyone, more to enhance one’s experience and I can understand and agree with this. The Royal Caribbean Anthem of the Seas is pretty much all it claims to be, a technological and luxury marvel on the sea. Teething problems and glitches aside, it “beggars the question” did we enjoy our time and would we go on another cruise? The food is first rate, the technology is astounding and the variety of things to do would keep even the most demanding of passengers satiated. From our personal point of view we probably wouldn’t go on another cruise, not because there wasn’t enough to do, not because we weren’t “wowed” – we were, but the thought of being in an enclosed space with anything up to 5000 people, the majority of which we wouldn’t know does not appeal to us. We like our privacy, we like peace and quiet and this is one of the few things that a cruise would struggle to offer us. We know that on vacations like this there would be stop-off points and a chance to find some privacy, but its those times in-between. There were highlights such as meeting Devin Alexander and sampling her food, learning about Sushi with Travis Kamiyama and the company of our wonderful hosts, but I believe cruise-ships require a certain mentality, ingrained within the majority of people, but not unfortunately within Natasha and myself.